In my 47 years I have never been to Australia. 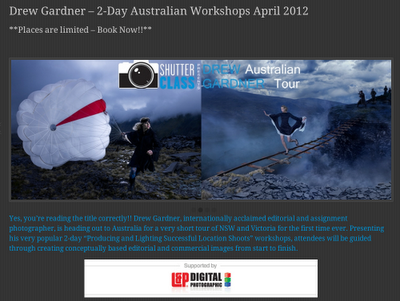 In April I will be doing 2 workshops, one in New South Wales, the other in Victoria. Think girls, animals, smoke and you will not be far off. These are not going to Drew 'Light' either but each will be a two day download of my heart body and soul which attendees will be able to take forward into their own sphere of photography, what ever that may be. Think of it as a tool kit to get the best out of your photography. Not only will it be a great chance to unlock potential in your own work but L&P will be along and you will get a chance for some time with the simply stunning IQ Phase One system and state of the art Profoto flash. I apologise for not announcing this workshop on this blog, I see from my Google Analytics I have followers in Aus. The bookings site went live a couple of days ago and I'm pleasantly surprised by the number of bookings already. If you want to get my take on taking your photography to the next level and adding a certain wit and sparkle to your photography that your competitors will not have please do join me. I do not intend to repeat these workshops in Australia at any point in the near future.